E-cigarettes, or electronic cigarettes, are battery-operated smoking devices. They often look like cigarettes, but work differently. Using an e-cigarette is called vaping. The user puffs on the mouthpiece of a cartridge. This causes a vaporizer to heat the liquid inside the cartridge. The liquid contains nicotine, flavorings, and other chemicals. The heated liquid turns into the vapor that is inhaled. Article: Burns injuries from e-cigarettes kept in pockets. 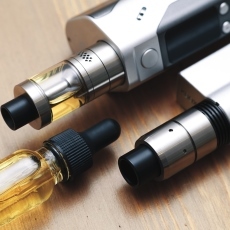 Article: E-Cigarettes to Assist with Smoking Cessation. Article: A Randomized Trial of E-Cigarettes versus Nicotine-Replacement Therapy.